I tend to get chicken quarters (leg and thigh) at the Farmer’s Market more often than I get chicken breast or any other meat. Mostly because they are cheap, they are typically the perfect size, and they are hard to mess up. This recipe is just one of the simple ways you can make chicken quarters. 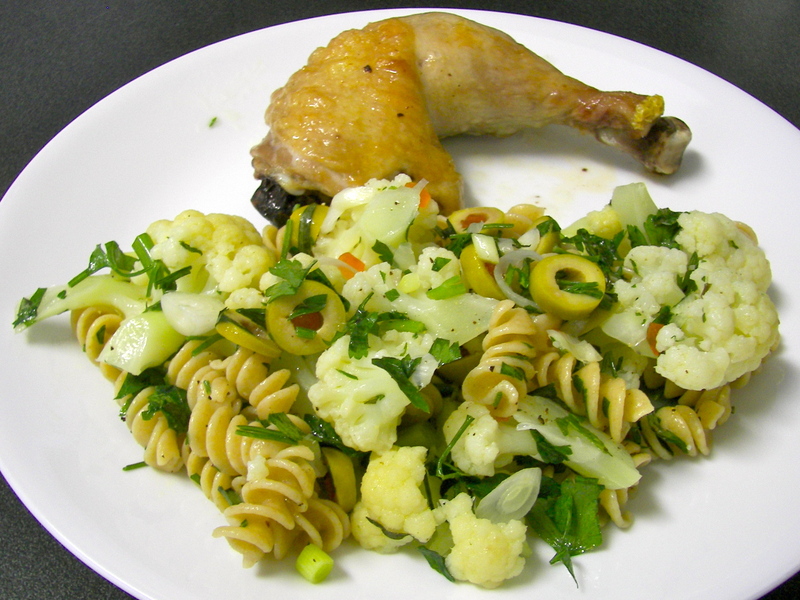 In a bowl, toss chicken with olive oil and lemon juice; season with salt and pepper and marinate 1 hour (or up to a day). Preheat oven to 375 degrees. Roast chicken, skin side down, in a roasting pan, 20 to 25 minutes; flip and roast 10 more minutes. Stir together grainy mustard and honey and season with salt and pepper. Brush glaze onto chicken and broil 5 minutes. 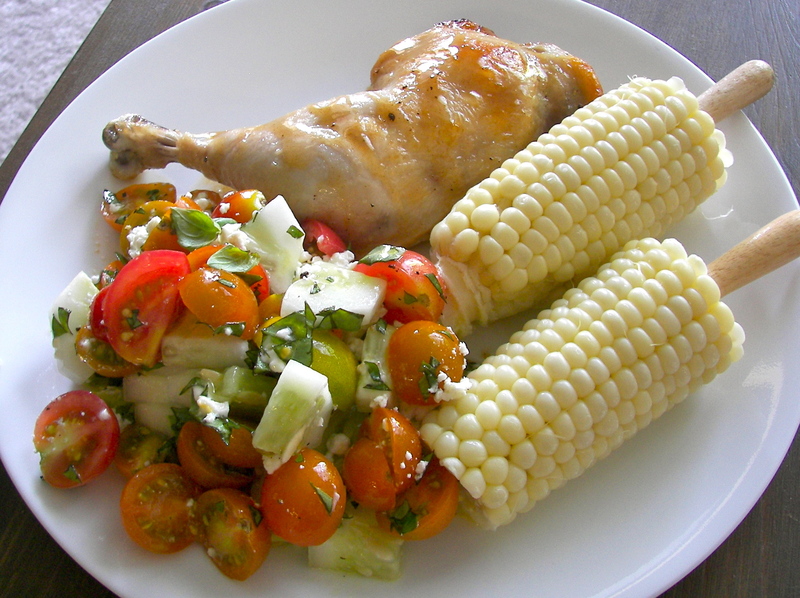 I served this with a salad of local tomatoes, cucumbers, basil and goat cheese, and some sweet corn on the cob. Another quick, cheap, and easy local meal. I love quinoa, and I’m always looking for new recipes, and new ways to use it. 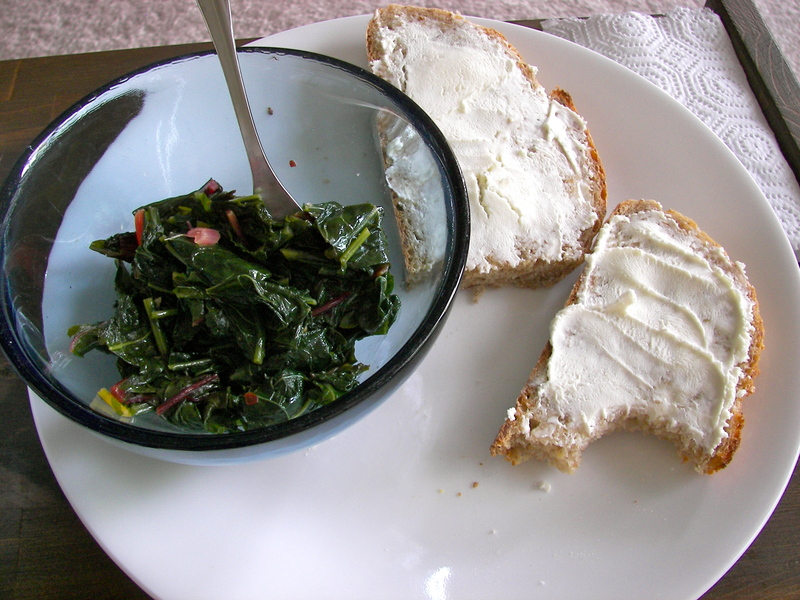 This is adapted from a recipe in the Moosewood Restaurant cookbook, an oldie but goodie. This was a great way to use some of my local basil, corn, and bell peppers. Make sure to toast the pine nuts before adding them, toasting them makes all the difference. Yum! In a large pot saute the onions and garlic in the olive oil for about 5 minutes, or until soft. Add the bell peppers, cumin, coriander and cook for 2-3 more minutes. Add the quinoa, water, and corn and bring to a boil. Cover, lower heat, and cook for 20-30 minutes, or until the quinoa is tender and all the water is gone. Stir in the basil and season with salt and pepper. Serve topped with the toasted pine nuts. 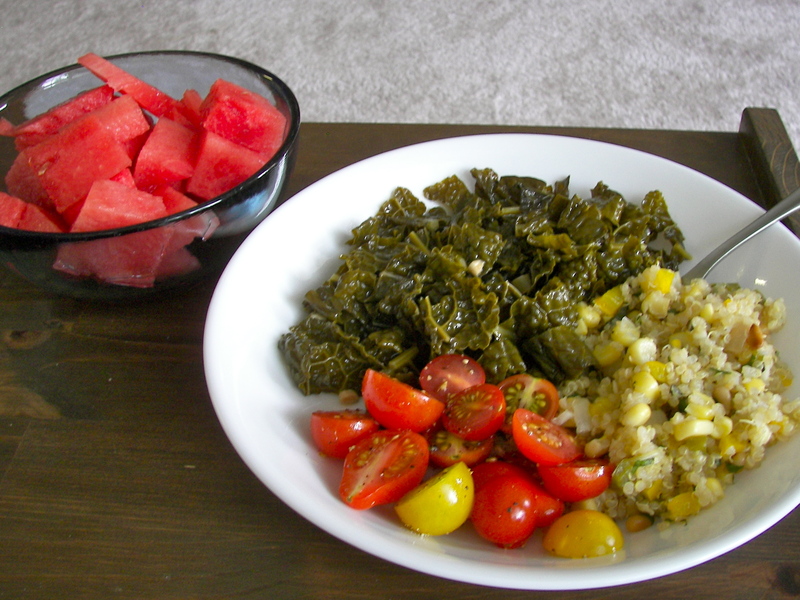 I served this with some local kale (sautéed with garlic and red pepper flakes), tomatoes, and watermelon. Another cheap, easy, local meal. 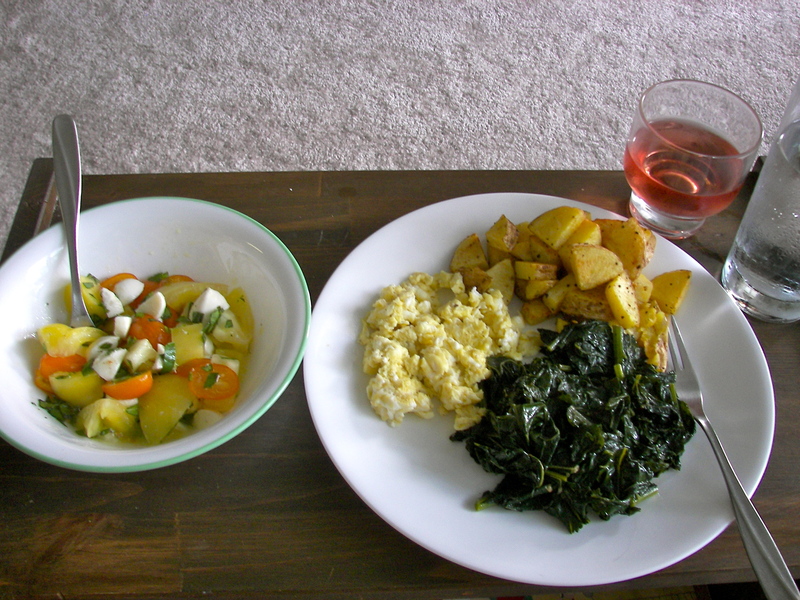 Here is another great example of how you can make a quick, yummy, local dinner. 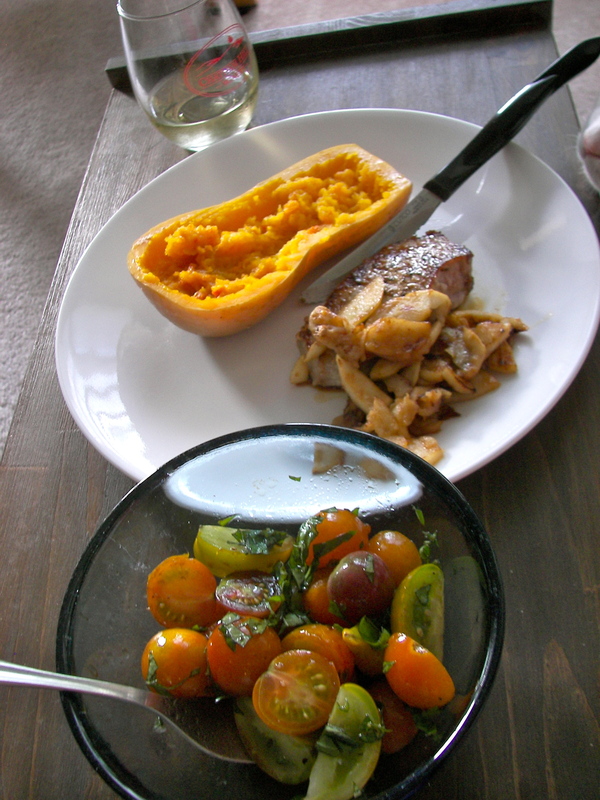 Baked butternut squash, pork with apples, and a tomato basil salad. All local! For the baked butternut squash, wash then cut the squash in half, scoop out the seeds then place face down in a roasting pan, add a little bit of water and roast about 30 minutes in a 375-400 degree oven, or until the skin starts to brown. The pork chop is first seasoned with a little salt and pepper then very simply cooked in skillet, over medium heat. When it is almost done, throw in some sliced apples, and about 1/2 Tbsp butter and cook till the apples are browned and the pork is done (at least 145 degrees inside). The salad is a yummy mix of sliced heirloom tomatoes, minced basil, olive oil, balsamic vinegar, salt and pepper. Yum! By now we have all heard the reasons to eat local (better for us and the environment). However, many people still think it’s too expensive. It doesn’t have to be. This dinner is one of many examples of a cheap and healthy meal, and it happens to be 100% local. Typically the meat will be the biggest purchase, so if you’re on a budget: eat less meat. You can choose either smaller portions, or fewer “meat” meals, or both. This was an easy and yummy recipe. A great way to use the cauliflower I got from Maple Spring Gardens, the green onions from Capritopia Farm, and the fresh tarragon from Bracken Brae Farm. The chicken I served this with was from Little Tree Farm. Bring a large pot of water to boil, salt the water and add the cauliflower, boil until tender- about 3 minutes (don’t over cook!). Scoop the cauliflower into a large bowl. Add the pasta to the still boiling water. Add the green onions, herbs, olives and olive oil. When the pasta is done, drain and add to the cauliflower, season with salt and pepper. Yum! 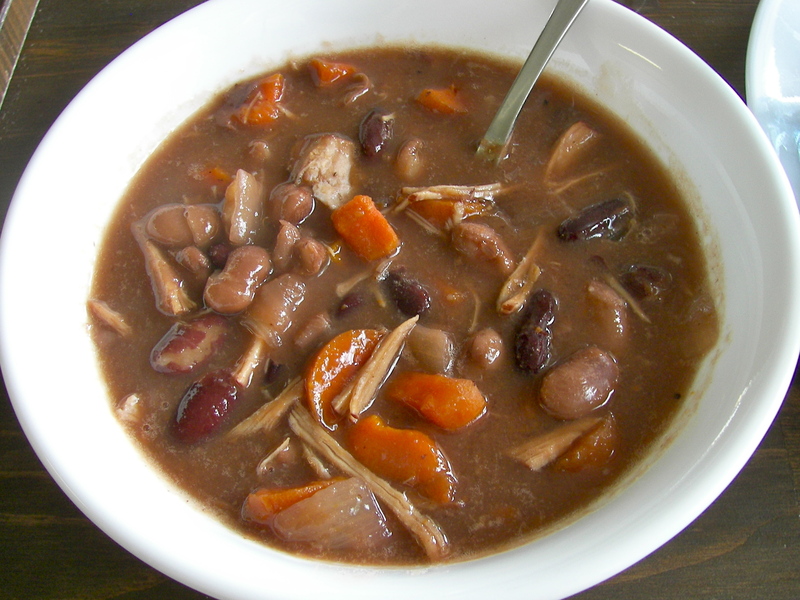 Put all this in the slow cooker and cover with water (about 2-3 inches above the top of the beans). Cook on low for 8 hours. Season with salt and pepper. Yum!